Appleton, WI. 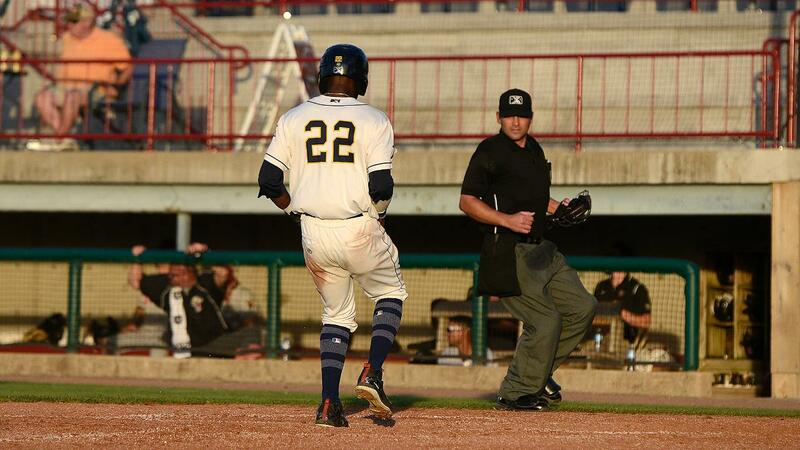 - The Burlington Bees (14-28,44-67) were back in action Wednesday night to begin another away series against the Wisconsin Timber Rattlers (22-23,53-61). Although the Bees struck early, it was Wisconsin who took the series opener by a final score of 2-1. Dylan File (7-9) ended his three game losing streak with his seventh win of the season, going seven innings, allowing one run on seven hits, and struck out six. Austin Krzeminski (4-5) suffered the loss after allowing the go ahead run in the seventh, even though the run was unearned. Krzeminski's stats for the day were two innings, one unearned run, one hit, one walk, and five strikeouts. Tim Millard gave Burlington their first scoring chance of the game after hitting a one out double to right for his second double with the Bees. After a groundout from Kiki Menendez, Julio Garcia drove in Millard on a single to center for his 46th RBI of the season, giving Burlington a 1-0 lead. Garcia also advanced to second on a fielding error by Nic Pierre, but Harrison Wenson struck out and the Bees couldn't do anymore damage. The score didn't stay 1-0 for long, as the Timber Rattlers were able to respond in the bottom of the second with a run of their own. Eddie Silva got things started with a double to left for his third with Wisconsin, and Payton Henry drove him in on a two out double to right, easily scoring Silva to tie the game at 1-1. Pierre tried delivering another hit to give Wisconsin the lead, but he also struck out to end the inning. After a long stretch of having the game tied, Wisconsin got their first lead of the game in the bottom of the seventh. Darren Seferina led the seventh off with a single, and advanced to second after stealing his tenth base of the year. Wenson then allowed the pitch from Krzeminski to go past him, which made Seferina want to head to third. Wenson threw the ball to third to try and throw Seferina out, but the throw was off and Seferina was able to score on the throwing error, giving Wisconsin a 2-1 lead. Despite having ten hits, the Bees couldn't find a way to drive in runs, as they went 1-10 with runners in scoring position. Torii Hunter led the first inning off with a single, and the Bees failed to even advance him to second. Leonardo Rivas hit a one out single in the third, but Orlando Martinez grounded into a double play. Kiki Menendez led the fifth off with a double, but the Bees recorded three straight outs, without Menendez even reaching third. Burlington had runners on first and second in the seventh after singles from Millard and Garcia, but Wenson struck out for the third time to end the inning. Rivas hit a one out double in the eighth, but Martinez flew out, and Kevin Williams Jr struck out to end the inning. Burlington got back to back two out singles from Menendez and Garcia in the ninth, but Wenson flew out to end the game, giving Wisconsin a 2-1 win. Tim Millard didn't do so well in his first time facing Wisconsin, as he went just 1-11 against them last week. However, Millard found his bat after the 5-5 game and continued his solid hitting with another multi hit night, going 2-4 with a double. Kiki Menendez also had a 2-4 game, which is a huge step after having just two total hits in the previous five games. The Bees also got another good day from Leonardo Rivas, who has now finished with at least two hits in four of his past five games. Julio Garcia was the big hitter for the Bees though, going 3-4 and driving in the Bees only run. What really hurt the Bees was 0-4 days at the plate from Martinez and Wenson, who had multiple at bats with RBI chances. Clayton Andrews pitched in his seventh game for the Timber Rattlers last night, and once again didn't disappoint. Andrews pitched the eighth inning and got out of a big jam after the double from Rivas, but still pitched his way out of it to pick up his first hold. Robbie Hitt took over in the ninth but did allow two hits to give the Bees a chance but got Wenson to fly out to earn his seventh save of the year. The Bees will look to put this loss behind them, as they will be battling Wisconsin again tomorrow night at 7:05 again. Burlington has not announced an expected starter, but Wisconsin is expected to start Aaron Ashby. Ashby has only had two starts for Wisconsin this season, but his last came against Burlington, where he allowed two runs on six hits in four and two thirds innings.